Every trip I make (either with Kyle or my family), we always miss riding some of the attractions. This trip was no exception to the rule. There were numerous attractions we missed, and surprisingly most of them were big ticket attractions. Usually missing attractions doesn't bother me. I mean, I going to visit the parks again. I will get the opportunity to ride those attractions some other day. Unless this is the ONE trip your family will take to Walt Disney World, you need to be ok with the reality that you will miss out on some attractions. Instead, focus on the awesomeness that is the attractions you see. 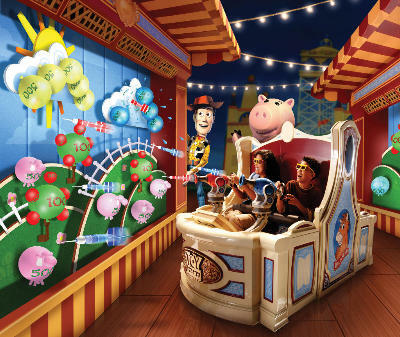 Toy Story Midway Mania: While I LOVE this highly interactive ride, I don't love the long wait times. I understand the desire to want to play the game because I so want another chance to beat Kyle at this (since he's still undefeated), but I think we used our time better by not doing this ride this time. Space Mountain: I'm not sure how we missed this. We meant to do it during MVMCP, but I think we hurried off to eat when we were in Tomorrowland and then forgot to go back. I enjoy this roller coaster, but there are others I like more. Carosel of Progress: No, this isn't a big ticket attraction, but it is one of my favorites. Anyone who has "ridden" it with me knows I sing along the entire time. Who can help but join along? It was closed during MVMCP, and we missed it the day we spent in Magic Kingdom. I'm mildly sad that we missed this. He looks cute here. I think I need to experience this. Stitch's Great Escape: I put this on the list because it's one of the few attractions I still can't get up the courage to visit. Maybe I'll do it in November. I'm not sure, but this time I had no desire to smell the "chili burp" or whatever it is people whine about. Kyle definitely wasn't going to drag me onto this ride, and I'm not sure I could drag him on it even if I wanted to ride it! Soarin': This is another attraction I'm actually kinda sad we missed. The times just didn't work out for us. We were either at Epcot after FastPasses were gone, or we didn't want to stand in line for 3 hours. We were at Epcot every day but one, so we should have checked for FastPasses one morning, but we didn't. We did get to ride numerous rides more than once there, so I still count myself as lucky! Test Track: I enjoy this ride, but I'd like it more if it had different sequences every time you rode kind of like Tower of Terror. I don't need to have this experience over and over again. Mission Space: I don't understand people's love of this attraction. I refuse to go on the "I volunteer for an attraction to kill me" orange side, and the green side is boring. I didn't push going on this ride since I didn't care for it. I'm betting Kyle's a little bummed we missed it, and I always offered to play at the end of the ride while he rode, but we never got there. Cool ride but very wet ending! All Water Rides (Splash Mountain and Kali River Rapids): Who likes to walk around theme parks soaking wet? Raise your hand! OK, let's add wearing jeans to that mix. Any takers? No? Didn't think so. I don't have to get soaked to feel like my trip is complete. I still have not experienced Kali River Rapids, and I'm not sure I ever will. As for Splash Mountain, I do want to ride it again, but we never got over there. The underlying theme here is "we never got over there." We were having so much fun and enjoying so many of our favorite attractions and places that we didn't make it to some others, and that's ok. I found this trip to be more relaxing than usual because we weren't rushing around nonstop. A note on the super low crowds: Even with very very low crowd levels, the top attractions can still have 2-3 hour waits and will run out of FastPasses quickly. The low crowd levels allowed us to ride most other attractions with 0-20 minute wait times (heavy on the 0-10 minute section). What attractions on this list are you shocked that we missed? I have been following along with your adventures here and on twitter and thought it was high time that I said hello! I am surprised that you missed TSM - we love that ride and get uber competitive about it. Though even with fast passes it takes about 35 minutes to go through the line and ride. And I am also thrilled to find someone else that does not get the big deal about test track. You could do all that at home in your own car. Sort of :-) I am curious to see if there are going to be any changes to the actual ride part with the refurbishment. And again, so with you on the wet ride thing. I have also never ridden Kali - but my kids for some reason enjoy being sopping wet for the day. Not sure that I understand their joy over this ride!! I was a little bummed about missing TSMM because I'm highly competitive too. Playing the Buzz Lightyear Space Ranger Spin twice kinda helped though. Oddly I'm a little more sad that we missed CoP than I am about TSMM. Has your family played TSMM on the Wii? We've had a blast playing it. Not quite the ride, but it's still fun. I'm curious about the TT refurb too. I would enjoy a new experience there. My nephew loves the ride, but I'd rather go ride Nemo with my niece while he rides that with his parents. I love Buzz light year too - it's the competitive thing. I've even tried to "cheat" and watch you tube videos on how to max out on Buzz - and I still can't do it. But when my husband and I went in February - he managed to get a perfect score - and he got a "Galactic Hero" button from the CMs there. I'll never hear the end of that one! Thunder River!! We actually live outside of Atlanta - but my husband either takes the kids to Six Flags or they go with friends - I just am not a fan. Though I didn't like the water rides when I was a kid either. OH, and I have to tell you that my daughter wants to be a goddess of math too :-) She's an 8th grader in a Trig class. We've been homeschooling her but our county has a charter school for science, math and technology and will know what to do with a 9th grader in AP calculus (which is good, because I am not a goddess of math!). What grades do you teach? That's AWESOME about your daughter! Kudos to her for excelling at math! We need more women in the field! I teach Algebra I & Pre-AP Geometry. I've taught a test prep class in the past for high risk kids. I did see :-) I don't forget where they are - but I just can't hit them. Sometimes I can get 200-300K - but on the videos, they max out so quickly. I can't figure out which red dot is mine! She is very math/science minded and wants to be an engineer. Specifically she wants to be an Imaginner for Disney and design rides. Speaking of which, I am sooo excited about her middle school graduation gift - and most people won't care - but you might - and it's a surprise: I somehow just last week - managed to get us a lunch with an Imagineer reservation for when we go in May!! I'd be upset missing a few of those on a trip too! Though IMO, Stich is one of the few missable rides at WDW. The seats and restraints are really really uncomfortable! Ooo CoP is a must do every trip, I find it's so overlooked by many other guests. I know several Disney-trippers who have been twice as often as I have and have NEVER rode it! Scandalous! !